It is not uncommon for someone to die without anyone present. This is referred to as an unattended death. It may be a suicide, a crime-related fatality, or a death from natural causes of someone who lived alone and whose passing wasn’t noticed at first. Since a human body begins to decompose quickly (the process begins within 24 hours), it is imperative that it be removed and the area cleaned up as soon as possible. Unattended death cleanup is one of our common services. But there are times we are called on to provide those same biohazard cleaning services in an attended death. We were contacted by a property management company to handle some things following the death of a resident in a senior assisted living community. The man was suffering from a terminal illness, and though not yet incapacitated and requiring care in a facility, he was somewhat impaired physically and his wife and other family members were providing care for him. Unfortunately one night in his sleep his condition worsened rapidly, and his wife awoke to find him unconscious and hemorrhaging, in a pool of blood on the floor next to their bed. She placed a call to 911, but by the time they arrived the man had died, having basically bled to death. The carpeting was soaked, the bedding and mattress were blood spattered and so the property manager contacted us to come in and take care of things while the wife and family were away making arrangements for his funeral. Other than his cancer, the man had no other health issues that would be considered health threats. He was not suffering from any infectious disease, and so that was not the concern. 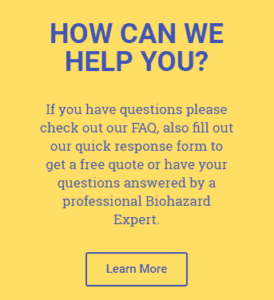 So why would the property manager want to have a professional biohazard cleaning company come in? Simply due to the amount of blood. 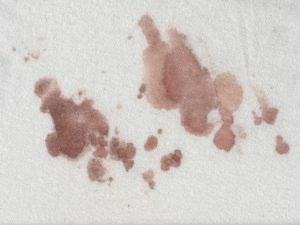 Small blood stains are usually cleaned up easily if taken care of quickly. However, in this case it was substantial enough to soak the carpeting. And in all likelihood it was wicked quickly to the pad beneath it and probably the floor. Standard household cleaning products and procedures are rarely sufficient to deal with a blood spill like this. Our task was to remove the carpet and dispose of it properly, then decontaminate the floor. We also removed and disposed of the mattress and the bedding. Why the urgency? The primary reason was to get the room cleaned up before the wife returned. She had suffered an immense emotional trauma with the unexpected loss as well as the graphic nature of her husband’s death. Imagine how coming back to see the bloody scene would have affected her. We are thankful the property manager had sufficient compassion for her to quickly arrange cleanup. The second reason is that in order for this residence to be rented out again, it would need to be cleaned, decontaminated, and restored. The wife did not need care services and thus would be moving out of the unit, but not knowing when this would occur, the property manager thought it would be best to get it taken care of right away, especially while she was gone making arrangements for her husband’s funeral. The third reason is that bodily fluids such as blood can be a breeding ground for bacteria and other undesirable microbes. Getting those fluids cleaned up quickly helps reduce the spread of disease and other health threats. We were able to get the carpeting and bedding out, and the room cleaned up and restored as best as possible before her return. Installation of new carpeting was done after she moved, but we were able to remove both the physical reminder of the trauma as well as the potential biohazard in her absence. If you are in need of emergency cleanup of blood – like the owner of this property was – you can count on us for compassionate, respectful, and efficient service. We serve the greater Spokane area as well as other parts of Washington state and the Pacific Northwest.